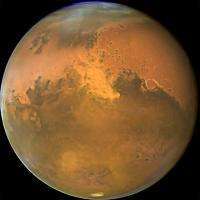 This NASA Hubble Space Telescope image shows Mars in 2005. The European Space Agency (ESA) on Friday named a Frenchman and a German who will join four Russians in an innovative 105-day isolation experiment to test whether humans can one day fly to Mars. The European Space Agency (ESA) on Friday named a Frenchman and a German who will join four Russians in an innovative 105-day isolation experiment to test whether humans can one day fly to Mars. How about sending up three expoditions at once, in the same window of oppertunity. This way we will not have to deal with the isolation factor. Isolation will not be a factor. Cosmic radiation will.